From rock to funk and pop, the OB-Xa could do it all. 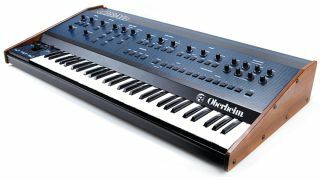 Yeah, we know Oberheim's SEM and its two-, four- and eight-voice configurations were terrific, but it was the OB series that would put the company's instruments in the spotlight in the early '80s. Beloved by new wavers and metal merchants alike, Gary Numan called the OB-Xa the best analogue synthesizer ever. Oberheim's adverts of the day presented the OB-Xa as an evolution of their line of synths - and indeed it was. The Oberheim sound was defined by a thick, woolly growl resulting from multiple complete synthesizer circuits - one for each voice - all individually calibrated and tweaked and so sounding slightly different. This approach went back to those two-, four- or eight-voice SEM synths that were nothing more than a bunch of individual SEM modules strapped together with a keyboard stuck on. They required the parameters of each voice to be individually set and offered only limited storage, but the sound was immense, and Oberheim followed up the polyphonic SEM with the OB-X, tucking the individual voices under the hood and putting their parameters under computer control. The OB-Xa further refined the approach, this time using Curtis filter and oscillator chips to add another level of stability and adding new features like keyboard split and voice layering. Oberheim also paired its distinctive 12dB filter with a 24dB job. Missing was the OB-X's cross modulation section, but a ripping oscillator sync went some way towards making up for the loss. "The OB-Xa was a classy instrument with a gorgeous sound, proving that you didn't always need endless bells and whistles." Available in four-, six- or eight-voice setups, the instrument was snapped up by many big names of the day, such as Rush, Talk Talk and The Police. It was the sound of Queen's Hot Space, Prince's 1999, and The Stranglers' Feline; and it was, of course, the synth Eddie Van Halen hauled out for Jump, so we know it could hold its own against even the loudest of rock bands. Truthfully, it's a simple machine: two oscillators, each with saw or pulse waves - oscillator two could only be switched in at full or half volume or switched off - and a noise generator that could only be switched on or off. No real mixing here. ADSR envelopes were provided for both filter and amplitude. Three LFOs, sample & hold and a huge unison function were included. In other words, the necessities to get in and make some quality sounds. And "quality" is the operative word - the OB-Xa was a classy instrument with a gorgeous sound, proving that you didn't always need endless bells and whistles. If you were very wealthy, you could make use of the D-sub connector 'round the back to hook your OB-Xa into the Oberheim 'System', consisting of the superb DSX sequencer and the legendary DMX/DX drum machines. Unfortunately, the OB-Xa was notoriously difficult to keep, often requiring costly and frequent servicing. Current owners also suffer from the scarcity and rising costs of the rare Curtis chips required to keep 'em running. Thankfully, most of us can make do with virtual recreations - though there are surprisingly few around. A spitting image of Oberheim's earlier OB-X, Sonic Projects' OP-X Pro II is a VST plugin for Windows and V-Machine that combines the features of both the OB-X and the OB-Xa. The sound is jaw-droppingly close. For the cost-conscious, there are (less featured) older versions at a lower price point, and a cheaper Reaktor ensemble. Again, the outside says "OB-X", but this surprise freebie from a new developer provides the features and sound of Oberheim's OB-X, OB-Xa and OB-8 (oscillator sync and Xmod? Sign us up!) This fellow recently graced our Freeware News section, but we'd recommend it even if we'd had to pay for the thing. A brilliant recreation. Part of the massive Bristol synthesiser bundle, the BB-Xa is an attempt to recreate the full OB-Xa experience for Linux users, with a few added touches such as a triangle wave option for the oscillators and slightly more flexible mixing. While the sound isn't as authentic as our other two entries, it'll get you in the door without an EULA.